Stu Price: Why are you peppering the steak? You don’t even know if tigers like pepper. Alan Garner: Tigers love pepper. It’s cinnamon they don’t like. 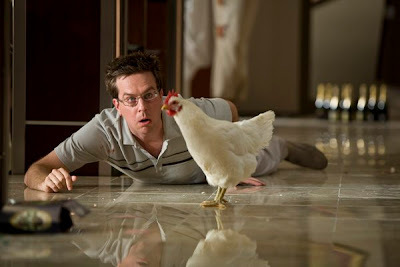 I think its fair to say that anyone who will see THE HANGOVER knows the pain of waking up to the birds chirping cheerfully outside and the sun shining brightly through the curtains, all the while wishing that it would all go away so you can sink into the hell you brought upon yourself. I myself have certainly shuffled back and forth between my bed and the toilet more mornings that I care to recall. What I don’t understand though is why anyone who does know this excruciating pain would choose to visit it voluntarily on the big screen. While watching THE HANGOVER does not inspire the same kind of nausea as a night of serious drinking, it does capture the subdued tone of the dreaded morning after pretty well. I stopped drinking excessively specifically to avoid this tone and THE HANGOVER is nowhere near a good enough reason to go back there. From the moment THE HANGOVER begins, the voice is unmistakable. A wedding is being set up, from the flowers at the ends of the aisles to the frilly icing on the cake. As we know that we are about to watch a buddy movie where four guys get wild and rowdy on a Las Vegas bachelor party, there is no question that director, Todd Phillips, is speaking distinctly to the men out there and that the beautiful floral arrangements and final wedding details are meant to be ridiculed. Look at how preposterous all these finishing touches are, men. Aren’t women completely out of their heads for spending so much time on all of this? Let’s go get drunk already. If you’re the type of man who thinks that tired and immensely ignorant setup is hilarious than you may very well love THE HANGOVER. After all, it isn’t long after this that you get to delight in the demonizing of women as every one we meet is controlling, manipulative and callous. It’s all very modern bride. THE HANGOVER is not about the women though; it is all about the men and their bond. The trouble is that I didn’t see anything remotely redeeming about this sad pack of losers. The groom himself, Doug (Justin Bartha), is completely uninteresting but that doesn’t matter as he is misplaced for the majority of the film. His impending brother-in-law, Alan (Zach Galafinakis) is a fat, furry troll of a man who is socially inept to the point of extreme discomfort – painful awkwardness is always a pleasure to watch on screen. Doug’s buddy Phil (Bradley Cooper) is ruggedly handsome but he steals field trip money from his elementary school class to spend at the tables and has zero respect or appreciation for his wife and child so it isn’t so easy to find him endearing. In fact, the only one of the bunch that is remotely winning is Ed Helms as Stu Price. Of course, Stu is completely whipped so you’ve got to love the guy. Poor thing has to answer to someone else; it is so horrible that people should be expected to be held accountable to the person they claim to love. Frankly, I couldn’t have cared less what happened to these guys as I wish that less guys like this actually existed. Really, how am I supposed to root for guys who are so dumb that they would leave a baby in a parked car alone? While Philips is savvy enough to structure THE HANGOVER so that we piece the mysterious evening together at the same time as they do, it all amounts to these unappealing characters going from scenario to extreme scenario asking people if they remember anything about their interactions from the night before. It also doesn’t amount to very many laughs so maybe the real hangover isn’t from a heavy night of drinking but rather an excessive indulgence in overdone average dumb guy comedy. An okay film not as great as I expected. I too was expecting more. I was expecting something fresh and original and got something old and tired. If only I had drank excessively before seeing it; maybe I could have blacked it out by now. I can see why The Hangover is of this summer’s biggest hits. First, it’s funny as hell. Any movie that can weave a baby, a missing tooth, and Mike Tyson into its plot is comedic gold. Second, the cast perfectly play off each other. 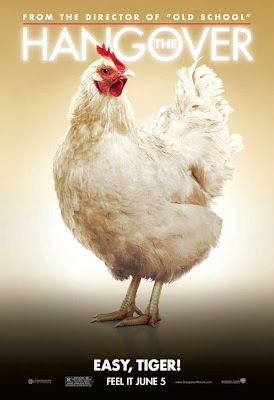 Bradley Cooper’s sleazy outspoken Phil, The Office’s Ed Helms’s whipped but goodhearted Stu, Zach Galifanakis’s indescribable Alan and Justin Bartha as Doug, the Groom, pull off each gag (No matter how gross), insult and wisecrack with great comedic timing. Third, Director, Todd Philips and Screenwriters, John Lucus and Scott Moore used a different approach to tell a standard comedic story. They focus on the characters finding out what happened at the Bachelor Party instead of seeing their antics that night. Their reactions to their antics in scenes such as when Phil, Stu and Alan go to the hospital to find Doug or seeing themselves on Tyson’s security cameras are hilarious. I especially, enjoyed the twists and turns in the story such as what happened to Doug during the Bachelor Party. It was great to see some surprises in a comedy instead of the standard set-up the joke plotting. The Hangover’s success proves that not only do audiences want to laugh at the movies but also want to see well-made comedies. 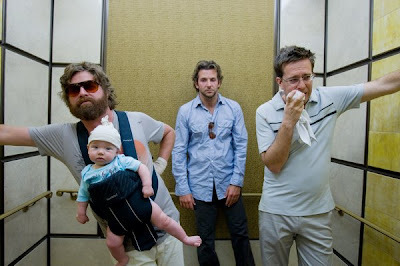 What sets “The Hangover” apart from some of the other absurd comedies of late, is despite the absurdity of the storyline, it is somehow believable, and it has heart. I thought it was hysterical and I didn’t feel like it should offend women, in fact, it makes the men look a lot more stupid than the women!